It was only eight years ago when then-Commerce Secretary Gary Locke told an audience that fewer than 1 percent of all U.S. businesses were exporters, and of those that did, 60 percent sold just to a single country, usually Canada or Mexico. Flash forward to 2018, and thanks to eCommerce and technological innovation, the number of U.S.exporters is on the increase. According to eBay’s U.S. Small Business Global Growth Report, more than 90 percent of businesses operate via the eBay platform export, with almost 80 percent selling to five or more countries. Further, the report found export-oriented firms grew almost 60 percent faster than companies focused only on sales within the United States. The New York Times profiled a Homer, Alaska, artist who used to rely solely on tourists to purchase his products and on local retailers to stock up on supplies. But thanks to Amazon. com, including the international network of consumers accessed via Amazon Marketplace, the artist’s livelihood has changed dramatically. About 70 percent of his signature “art lamps,” made from local beach stones, are now sold through Amazon to U.S. and international customers, the Times reported, a figure that was zero less than two years ago. Managers at Gelb Music of Redwood City, California, say that global markets “saved” their business, which has been operating since 1939. The retailer began listing its musical instruments and accessories on eBay nine years ago, and today, exports account for 30 percent of sales. These success stories, however, are not just happenstance. Selling to an international market requires a strong commitment to spend the time and resources required to overcome hurdles, including market research, identifying a local partner, advertising, supply chain reconfiguration, language and cultural issues, and the border clearance process. “The path to exporting is very challenging – especially for small businesses,” Jody Milanese, vice president of government affairs for the Small Business Exporters Association, told CNBC. Gelb Music’s eCommerce manager Mike Craig would seem to agree: “When you look at traditionally trying to ship overseas – we didn’t understand the laws, and the costs were outrageous,” he told CNBC, noting the cost of shipping a single guitar to Australia could exceed $300, before learning about trade programs that helped manage costs. Knowing about potential problems associated with exporting ahead of time and proactive planning are integral to any business’s export success. The good news? Potential exporters will find an abundance of resources to help understand and navigate the process, and even help lock in funding. This includes services available through the federal government, including the U.S. Commercial Service, the Small Business Administration, and trade offices maintained by each state. As a starting point though, it’s important to understand the “top issues” every exporter must address, regardless of size or industry. All exporters, for example, must contend with the customs process and must have a logistics strategy in place to ensure that products will arrive at their international destination on time, as promised to their customers. The following discussion will highlight core issues a business must be prepared to address. Successful exporting is a difficult process, but a business can help itself by understanding the key challenges and having the proper resources in place to build positive and lasting international relationships. The company eventually apologized to its customers and halted the imposition of customs fees, but a very expensive lesson was learned. These examples illustrate the critical importance of doing your homework and developing a comprehensive strategy for entering a new market – before launching any initiatives in that market. Failure to do so, in fact, is cited by the U.S. Commercial Service as a top reason U.S. businesses do not succeed in their exporting endeavors. Which products are selected for export development, and what modifications, if any, must be made to adapt them for overseas markets? Is an export license needed? In each country, what are the basic customer profiles, and what marketing and distribution channels should be used to reach customers? What special challenges pertain to each market (for example, competition, cultural differences, and import and export controls), and what strategy will be used to address them? How will your product’s export sales price be determined? A similar publication, Export Business Planner for Your Small Business is available through the U.S. Small Business Administration. 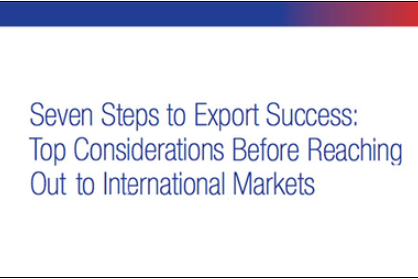 Users can download the document, which includes a series of worksheets that business owners can use to help plan their export strategy. With exports of goods contributing $1.5 trillion to the U.S. economy during 2016, and supporting almost 11 million jobs, federal and state governments have a strong interest in helping businesses succeed in international commerce. Trade professionals are available to offer guidance throughout every step of the planning and execution process, including helping to secure necessary funding, opening doors to potential partners and customers, and helping with international regulatory and customs requirements. As defined by the government’s website, the U.S. Commercial Service (USCS) is the trade promotion arm of the International Trade Administration within the Department of Commerce. The core of the USCS is a network of Export Assistance Centers located across the United States and in more than 80 countries worldwide. Each Export Assistance Center is staffed by professionals from one or more of the following: Small Business Administration, Department of Commerce, Export-Import Bank, and other public and private organizations. The Small Business Administration (SBA) is charged with helping small businesses to grow and succeed, and export promotion is integral to its mission. SBA assistance is available in several ways, including counseling and training, finding international buyers, and exporting finance programs. Export Express Loan Program: Offers streamlined financing up to $500,000. It is the simplest export loan product offered by the SBA, with approval typically granted within 36 hours. Any business in operation at least one year that can demonstrate loan proceeds will support export activity is eligible. Export Working Capital Program: Offers financing up to $5 million as a credit enhancement. This program is delivered through SBA Senior International Credit Officers located in U.S. Export Assistance Centers. International Trade Loan Program: Offers loan financing for fixed assets and working capital to businesses that plan to start or continue exporting, or that have been adversely affected by competition from imports. In addition to extensive assistance available at the federal level, businesses can take advantage of export resources offered through their state government. Most states maintain international trade promotion offices, staffed by experienced trade professionals, that can help businesses navigate the export process. Trade Missions in which approved companies travel to a specific international market with members of the South Carolina Department of Commerce to meet with prospective distributors, agents, and partners. Trade Exhibitions, such as the Paris Air Show, where state businesses involved with a particular industry have an opportunity to promote their company at trade shows. South Carolina Export Development Services. A division of the state Department of Commerce, Export Development Services works with companies of all sizes to assist in identifying export opportunities throughout the world. South Carolina District Export Council. Assists South Carolina businesses interested in exporting, with particular emphasis on small- and medium-sized exporters. The Council is a private sector organization, although Council members are appointed by the U.S. Secretary of Commerce. South Carolina Department of Agriculture. The department’s Marketing and Promotion Division works to help identify customers – both U.S.-based and international – for South Carolina’s important agriculture industry. South Carolina Forestry Commission. The department’s Economic Development division offers assistance in promoting trade opportunities for South Carolina’s wood products industry. World Trade Center South Carolina. Business-led and business-financed group that works to assist businesses in identifying import and/or export opportunities. Similar resources are offered by other state governments. Important to note is that the overwhelming majority of businesses that make up any given state’s export base are small- and medium-sized enterprises (SMEs). In South Carolina, for example, 85 percent of exporting businesses are SMEs. The bottom line is that regardless of where a business is located, what product it manufactures, or how big or small it might be, there is assistance available. Government at both the federal and state level has a stake in growing U.S. export volume and in providing the tools to help make that happen. The assistance is there for the taking, a business only need ask. U.S. retailers – especially those that sell directly to consumers via eCommerce – are keenly aware of the critical need to deliver a top-notch “customer experience.” This means accommodating consumers’ exacting demands for every aspect of the shopping experience, including website functionality, product selection, price, terms of delivery, premium customer service, and a hassle-free returns policy. In today’s omnichannel marketplace, customers are firmly in charge and expect a say in virtually all aspects of the retail transaction, and savvy retailers are paying attention. Well guess what? International consumers share many of those same expectations, even if a shipment needs to cross an international border before arriving at its final destination. Payment Options. PayPal, or an equivalent service, was the preferred payment option of 41 percent of overall consumers, followed by credit cards, preferred by 33 percent of consumers. PayPal was most popular in Germany (68%), Australia (64%), Spain (62%), and Italy (61%), and least popular in Japan (5%). Delivery Speed. Retailers understand consumer expectations for rapid deliveries to consumers located in the same country, but what about expectations for shipments that need to cross an international border, including possibly an ocean? The IPC research found limited patience for the added hurdles an international shipment must clear. U.S. and Canada. Almost half of the survey respondents expect to have their cross-border shipment within 4-5 days. Intra-European shipments. Almost 60 percent of European consumers expect delivery from another European country within 2-3 days. But for shipments coming from Asia, consumers would wait a maximum of 6-7 days. Australia/New Zealand. Half of the consumers in Australia and New Zealand expect shipments traveling between the two countries to arrive within 4-5 days. Post office was the preferred delivery location in Norway (50 percent), Iceland (41 percent), and Sweden and Finland (both 35 percent). Delivery to the workplace was preferred by 14% of Portuguese consumers. Parcel locker deliveries were mentioned most by consumers in Finland and Denmark. Retail outlet deliveries were preferred by 11 percent of French consumers and 10 percent of Belgium consumers. Language. Care must be exercised to ensure that labels and packaging are written in the end consumer’s local language. A package arriving in Germany addressed in English will undoubtedly be delayed until a proper translation can be made. Labeling Requirements. Similarly, a retailer must ensure its product meets all local labeling and packaging requirements. In Québec, for example, where French is the official language, a retailer must follow the “Charter of the French Language,” which mandates that all product containers and wrappings, and all documents accompanying a product (directions, warranties), must be in French, with accompanying translations in other languages permitted. Currency/Weight Standards. Consideration must also be given to currency conversions and standards of measurement. Most of the world uses the metric system, so a U.S. business will need to ensure that all weights and package specifications are listed in metric measurements. Similarly, a website must list all pricing in local currency and accept local currency payment. Landed Price. Few things will outrage an international consumer more than being presented with an unexpected invoice at the time of delivery for customs fees and taxes. Consumers assume these charges are included at the time of sale, and in many instances, they will either refuse to accept delivery of the shipment or will pay the extra costs but never return to the offending retailer again. A retailer must take steps to ensure that, for every country in which it operates, a process is in place so the retailer can charge a landed price – inclusive of all duties, taxes, and brokerage fees – at time of payment. In Canada, for example, a U.S. business can register with the Revenue Canada agency as a “non-resident importer (NRI).” Having NRI status allows a U.S. business to act as an importer of record, meaning the U.S. business can clear goods into Canada and collect all taxes at time of purchase. Consumer Returns. Retailers selling to international markets must prepare for the inevitable flow of product returns with a hassle-free and efficient returns policy. This includes a process for allowing consumers to easily send back a product or, if possible, return it to a brick-and-mortar store. In addition, a process must be in place to quickly resolve the reason for the return, including issuance of a replacement or credit, and a way for consumers to track the status of their return throughout the entire process. At Purolator International, we are proud to serve as a leading supply chain logistics solutions provider for companies that ship to, from and within North America. As a leader in cross-border shipping, we have the tools and experience necessary to help you deliver superior service to your customers. Contact us online to learn more about our customized solutions today!